While setting up the ideal sound system can be one of the most satisfying things in the world, you will see that there are a few difficulties that you will have to deal with. Some issues lie in the setup of your speakers, like ensuring that they are all properly wired and ideally positioned for the best sound quality. On the other hand, there are also issues that you will have to deal with after you have finished setting up your speakers. These problems may end up appearing over time, or they may be matters that were simply overlooked during the setup process. Today, we are going to be looking at one of the latter issues. We are going to be giving you some tips on how to protect floors from speaker stand damage in this article. 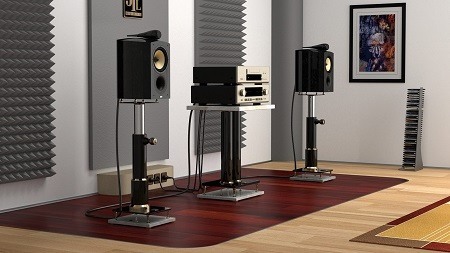 You will find that speakers and speakers stands can vibrate and even move with loud enough music, so if you are looking for hardwood floor protection, then you have come to the right place. You have quite a few options available when the time comes to ensure that your floor is adequately protected. Since most speakers are placed on spikes, you will find that protection is necessary for all but the hardest of floors. Most types of floor speaker stand will feature spikes, so there are few alternatives. The most common option to prevent damage from your speaker spikes is to make use of speaker spike discs. These are like little pucks that are positioned underneath your speaker spikes to ensure that your floor doesn’t end up damaged by the spikes. Since most speaker spike discs are made out of the same metal that the spikes are made of, you will find that this may not provide as much protection for softer floors. For example, you can also take advantage of a hardwood protector to ensure that wooden floors are better protected from this type of damage. One of the better methods of protecting your wooden floors from speaker damage is to make use of speaker spike pads. These are similar to speaker spike discs in that they are round and they are meant to be placed underneath speaker spikes, but they tend to be softer and more padded to prevent damage. You may be wondering why you can’t just place a pad or something similar underneath your speaker stand, but you will find that this can disrupt the balance of your speaker stand. An unbalanced speaker stand can move around while it is in use, causing vibrations which disrupt the audio quality or it may even fall over. There are many methods at your disposal when it comes to ensuring that your floors remain undamaged by your speakers or speaker stands. We hope that at least one of these methods is useful for you, as we have tried to include sufficiently varied ways of diminishing floor damage.